The process of acquiring a new donor can be tiresome and extensive, but it is worth it for the funding. What if, after the long and arduous process of getting a donation, your development staff could double that donation with 30 minutes or less time spent working? Wouldn’t you encourage them to do so? Well, they can. And they can do it through matching gift programs. Matching gift programs are fairly straightforward. That’s why it is shocking how few nonprofits take advantage of the funds available annually from corporate matching gift programs. How is the matching gift process structured? What kinds of nonprofits can benefit from matching gift programs? What is matching gift software? Ready? Let's get those questions answered. 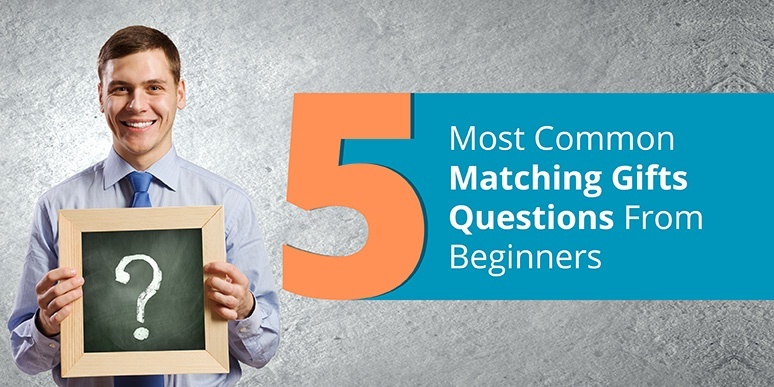 Question #1: What are corporate matching gift programs? Matching gift programs are a tool companies use to support the philanthropic endeavors of employees. Companies with gift matching programs will match the donations their employees make to a range of eligible nonprofits. Thousands of companies offer these programs under their corporate giving umbrellas. 65% of Fortune 500 companies have matching gift programs. Think of the possibilities! Unfortunately, the average employee participation rate in the programs is only an abysmal 9%, meaning an estimated $6-$10 billion in matching gift funds is unclaimed yearly. Those statistics need to change. Just like it is relatively easy to gain funds from matching gifts, those same gifts are just as easy to overlook—that’s why only 9% of employees participate. For starters, nonprofits are balancing a lot of donor information from day to day. Details like a donor’s company or spouse’s company can slip through the cracks. There also is very much a general lack of awareness of and knowledge about corporate giving programs among employees at a companies with these programs. And, if there is program awareness, there are often challenges with clearly communicating the details of the match process. It is so important to promote matching gifts before, during, and after the donation process. Make the additional steps as simple as possible for your generous donors. Question #2: How do matching gift programs work? Corporate gift matching sounds almost too good to be true. A company will have preset guidelines for matching and then when their employees donate to charities, the employer matches the program’s pledged amount. Typically a corporation promises to match on a dollar to dollar, or 1:1, ratio. So if an employee donates $500 dollars to your charity, a company with a 1:1 ratio would also donate $500, doubling that donation. Some matching gift programs will even offer gifts at 2:1 or 3:1 ratios, tripling or quadrupling the donation respectively. The restrictions of matching gift donations vary from company to company. Some have opportunities for all employee types from part-timers to retirees. Others require that the employee be full time. A program will have a maximum and a minimum match amount. The minimum is usually around $25, whereas the maximum ranges drastically with an average of $1,000-$15,000 annually per employee. Sometimes programs will specify that different level employees have different maximums. For example, Gap Corporation allots $1,000 annually for part-time employees and as much as $10,000 annually for Senior Vice Presidents and above. Matching gift programs are also discerning when deciding which organizations to match gifts to. More on that in a later section! Keeping the key components of gift matching in mind, let’s move on to the practical “how-to” of securing a matching gift donation. Question #3: How is the matching gift process structured? The process is simple on both the side of the donor and the nonprofit. As long as a donor knows his company matches gifts, the steps to complete the paperwork or electronic form submission are pretty standard. There will be a little variation from company to company, but that’s roughly it. Three steps on each side. One thing to keep in mind is that companies will put time limits on how long after a donation an employee can request a matching gift. Expiration dates can be anything from a set number of months since the donation date (3, 6, 9, 12) to the end of the calendar year to the end of January, February, or March of the year following when the donation occurred. You want to have donors apply for matching gifts as soon as possible after a donation. They will be much less likely to follow-through with the process the more time goes by. So, even a matching period expiration as short as 3 months really should be plenty of time. Being aware of common program deadlines can actually help your nonprofit make a big fundraising push. Do lots of your donors’ companies have year-end deadlines? Let them know! Really emphasize matching gifts and the common deadline in your fundraising materials at year’s end, especially as you kick off any year-end fundraising for your annual fund. Benefiting from matching gifts is all about knowing the system, being aware of the programs out there, and seizing ample opportunities when they present themselves. Question #4: What kinds of nonprofits can benefit from matching gift programs? For examples, companies like Microsoft, Home Depot, and Verizon match donations to a wide range of 501(c)(3) organizations. For the remaining one-third of year-round matching gift programs, they usually match to organizations which fall into one or multiple of the above organization types. For instance, ExxonMobil, which matched more than $34.4 million in employee donations last year, focuses its donation matching on arts/cultural and educational organizations. But the corporation also offers a volunteer grant programs where the company provides $500 grants to a much wide range of nonprofits when employees volunteer for 20 hours. Political organizations and houses of worship without a community-centered service initiative are commonly excluded from matching gift programs. The best way to determine if your nonprofit is eligible for a particular matching gift program is simply to check! You can always go directly to a company's website, but a matching gift database will probably be quicker. And remember: matching gifts aren't just useful for more donations, though they certainly do help in that regard. You can look beyond the funds and see future relationships in your matching gift research. Your donors' employment information can open a lot of doors for you, particularly if you're going to engage in prospect research or reach out to corporations for donations. Make sure you're housing employment information in your CRM. Question #5: What is matching gift software? There are so many moving parts to matching gifts that it's no surprise there's software to help simplify the process. Matching gift software can take any number of forms, from searchable databases of information all the way to services that automate the entire matching gift process. 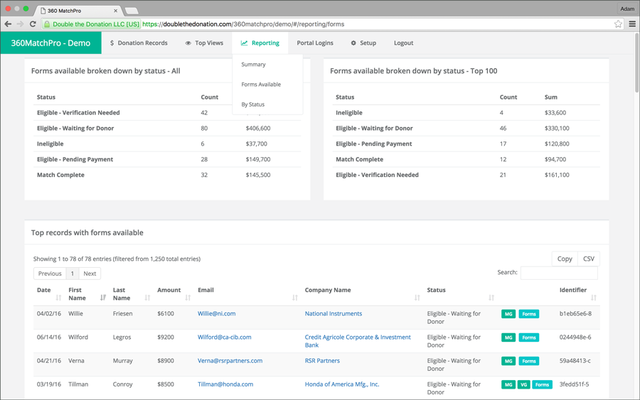 Double the Donation allows users to search an extensive database of matching gift programs from companies of all industries and sizes. Nonprofits can create a page hosted on Double the Donation's site that leads donors through the matching gift process, pulling their employer's information and presenting them with the forms they need. Double the Donation even developed a plugin that nonprofits can embed on their own websites, donation forms, you name it! Users type their employer's name into the plugin's search bar, and Double the Donation spits back out a wealth of information about the company's matching gift program. 360MatchPro goes a step further and automates the process. Larger nonprofits might not have the time or energy to devote to manually hunt after matching gifts. 360MatchPro uses email domains and search history to send targeted information to eligible employees. If you're looking to buy matching gift software, let your size and specific needs guide your decision! Now that you’ve got the basics down, it is time to go out and learn about the leading matching gift companies and how you can market these programs to your donors. Salsa’s Ultimate Guide to Matching Gifts. Ready to dive in deeper? Find out everything you ever wanted (and what you didn't even know you needed!) about matching gifts. Double the Donation's Guide to Marketing Matching Gifts. It's time to get the message out about matching gifts. Market matching gifts to your donors with Double the Donation's strategies and templates. Salsa's 12 Companies with Top-Tier Employee Matching Gift Programs. Chances are someone in your donor database works for a company that matches gifts. See if they're among the 12 top matching gift programs!